Probably all of us as adolescents had our cranky periods. Brookline never outgrew its. Unless you live there, they are too good for you anyway. They don’t even want you parking there. They don’t need your damned tourist dollars. If you are from a neighboring town, why don’t you just stay there? Speak to someone from Brookline and you are likely to hear how friendly they are. After all in schools, income, personal achievement and every other way, they are superior and have a lot of reason to be happy. The Brookline version appears here. You are not welcome. You will not park anywhere in town for more than two hours, and there will be places that permit less time or none at all for non-residents. You will not park on the street anywhere overnight. Go home. You don’t belong there. It doesn’t work the other way, of course. Many from Brookline work in the financial district, medical facilities, corporations and universities of Boston and Cambridge. You get a sense of the long standing of the Brookline attitude from its geography and governance. Brookline is a self-selected island of Norfolk County. 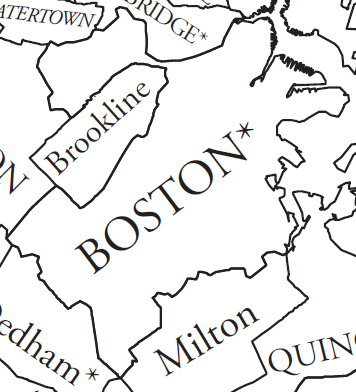 As you can see from the map, it appears to be a thumb protruding into Boston’s bottom. The rest of Norfolk County is to the South. Brookline refused to join Boston on several occasions, the last in 1873 when the town of West Roxbury agreed to annexation. Now Brookline is an exclave (not coincidentally sharing the first four letters with exclusive). Back to bicycling, for all its snootiness, Brookline as a town is OK by riders. They don’t have nearly enough bike racks (goes with the car-parking attitude surely), but the cops there expect drivers to play nice with riders. It has one nice, large park, plus the Olmsted site. We attend an old UU church there. The Brookline Village and Coolidge Corner areas have numerous OK, some good, but no great restaurants. (Note: Be very careful in the Village in the evening. Predatory towing services constantly monitor all off-street parking lots of closed businesses. 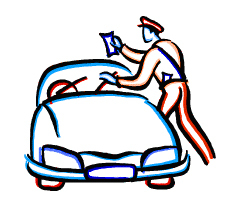 They will get your car within 10 minutes.) It also has a concentration of kosher restaurants and bakeries. 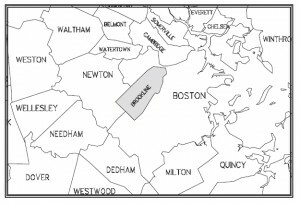 Brookline never joined Boston, never formed its own county and apparently never got lonely for the rest of it body and buddies. It is content to float solo. If you want to visit, bring quarters for the meters and for God’s sake, get out within two hours! The Duke feels strongly about mass transit and intercity rail. Speaking with us on Left Ahead! today, he was delightfully candid and brimming with specific fixes. Click the player below to hear the whole show. Head to Left Ahead! or iTunes to download the mp3 file. Among his analysis was a solution to the crippling debt of our MBTA system. The legislature and previous Republican governors had linked our mass transit’s fiscal health to a supposedly endlessly growing sales tax cut. That failed and was a terrible blunder, according to former Gov. Mike Dukakis. He said he desperately need a workable mass transit. “If you want a first-class public transportation system, you got to pay for it,” he added. His more rational solution is adding 6¢ to 9¢ to the long stagnant gas tax, devoting it to the T and commuter rail. Listen in to hear what he likes and dislikes about the current efforts. See also his co-authored piece on transportation reform that appeared in the Boston Globe. He has a very different take on the best way to manage it all, which he explains in the podcast as well. Cross-post note: I’ll duplicate this at Marry in Massachusetts. Brookline wants it all ways and often gets it. Locals there want to pretend they are urban and simultaneously suburban. They are likewise irrational about transportation — pretending to be great for drivers, parkers, cyclists, pedestrians. They feign being all things to all only the best, wealthiest, most privileged, a.k.a. Brooklinites. There’s no hiding from all this after the town selectmen’s meeting last week. They voted unanimously to boot the sole bicycle-oriented member of the transportation board. They will not renew Peter Furth’s two-year appointment. I would note that if a board does not have members speaking up for different components of their charge, there’s no need for the board. A single person would do just fine. How does FoxNews say it, fair and balanced? You would suppose that Furth is one of those flame-helmeted crazed cyclists racing headlong at tweedy professors and inattentive toddlers. Instead, you’d see a transit geek, a professor of Civil and Environmental Engineering at Northeastern University. His credentials look like he’d be an extraordinary resource for the transportation board and the town transportation division. He seems as wild as adding a cinnamon stick to the warm cider. That allegedly balanced guy they want to bring back on the board, Bill Schwart, has some expertise too. He is a transportation consultant. However, he focuses on bringing in new business for his consultancy. He bills himself as a multi-modal expert. Parking is to local conversation what weather is in much of Maine. Brookline it must first be said is one of those outsider-hostile towns in parking. There’s a two-hour limit throughout, not just in business districts. Even those who live on a street need to rent an annual permit for $25 if they want to park in front of their own houses. 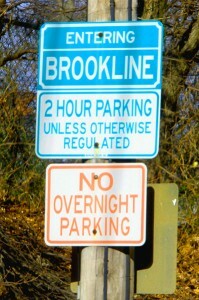 Why does Brookline have a Resident Permit Parking Program? The Transportation Board wants to preserve the livability of our residential neighborhoods by discouraging non-residents (e.g., commuters and commercial area shoppers) from parking on residential streets for long periods. 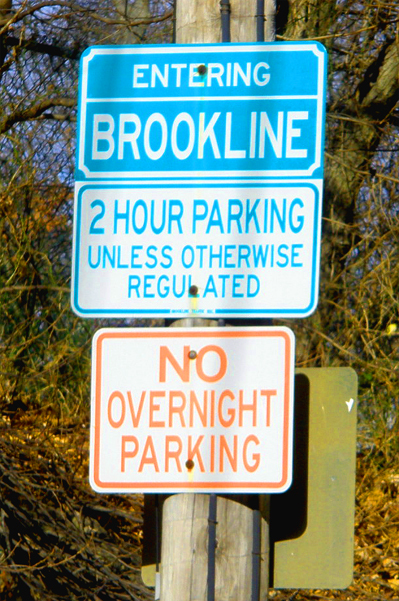 The Brookline RPP Program does not prohibit non-residents from parking on local streets for less than 2 hours, nor does it guarantee neighborhood residents an on-street parking space whenever they want one. Participants in the RPP Program also are not allowed to park overnight or to violate any other parking regulations that may be in effect on your street. However, residents who live in areas that experience high levels of on-street parking by non-resident vehicles will benefit from not having to move their vehicles to another street every two hours during daytime hours. This is a similar attitude that has led to so few publicly accessible restrooms in Boston, Brookline and other towns, even in their parks. Whether it’s a driveway or a toilet, you should have your own or you really don’t belong here, now do you? Back to the board, Furth seems a plain talker. He told the Brookline Tab that “If you speak up about bicycling things, you’re not considered to represent the town.” He noted that he sometimes has advocated keeping parking over bike lanes and at others pushed for more bike accommodation. An oddment here is that parts of the town, particularly the police department, are very bike friendly. Having attended several Moving Together conference sessions with the Brookline cops, I have been very impressed by their enlightened multi-mode mindset. Cyclists get run down by inattentive motorists there every year and the police do their damnedest through enforcement, education and participation in planning to keep pedestrians, cyclists and drivers in motion safely. Boston cops, many of whom seem to find bikes annoying anomalies, could learn. Another is former Gov. Mike Dukakis. We’ll try to have him on Left Ahead! to discuss transportation. He may be the biggest advocate for mass transit in the state. Yet, I have never heard him say a single phrase in support of cycling. At 76, he may stick with his shoes and Charlie Card. To its contradictory nature, Brookline also has a bicycle advisory committee. Their literature says the right stuff. It does seem to make inflated claims about a large number of residents biking for shopping and short trips. The eye and regular counts by the town don’t seem to support that. When I bike through, I rarely see a single other cyclist also. The selectmen seem to be in little hurry to change that. The advisory group may talk up the car-reducing potential of biking, but that board seems fixed on preserving as many parking meters as it can. That Furth fellow must have seemed very inconvenient, asking them to consider bikers and walkers at every stage of planning. Brookline has long been a thumb in the eye or other orifice of Boston and in fact looks like one on maps. In early Colonial days when it was known as the hamlet of Muddy River, it was part of Boston, but in 1705 it incorporated and then avoided the fate of Brighton, Roxbury and Dorchester, which became part of the capital city. Now it is a Norfolk County island surrounded by Suffolk County. It has its little ways, ways of which it is extraordinarily, and some would say irrationally, proud. Wanting to have it several ways on non-motorized transportation really is nothing that deserves pride. Fantasy aside, Brookline is not yet bike safe or accommodating. Many there want to pretend they are fairly European in being cyclists and cycle friendly. The town government other than the constabulary clearly conflicts with that. The of-one-mind transportation board won’t be leading to a multi-modal future. I have aged into more rituals than I had as a child in high church Methodism. Today involved no bishops or incense, rather a sward and farewell to legs (or at least leg tools). F0llowing my nasty tib/fib breaks and the surgery to fix them, I was like the classic riddle of the ages of man. Being my re-use/recycle mother’s son, I wanted to cleanse my psyche and house of these aluminum tools. They are considered junk, just another set of disposables in a throwaway economy. I wouldn’t have it and eventually located a savvy and civic-minded gentleman who knew better and was like minded. At Ayers Handicap Conversion Center, Chairman Bruce Ayers, adds volunteerism and helping to his health-aid business. He collects and hands out just such tools to those who need them. I won’t dwell on how Boston should be doing the same. Rather, let us praise him. Meanwhile, I happily am bidding goodbye to my tools — walker, crutches and cane. The Aircast is surely contaminated even after I scrubbed it, but I’ll ask about that too. It took a time to find a decent meadow in the area. The arboretum has not cut its open leas, but Brookline’s Larz Andersen park is plenty grassy. Plus the delicate locals could not be expected to walk in vegetation above shoelace height. I amused myself this morning by posing and shooting my tools. 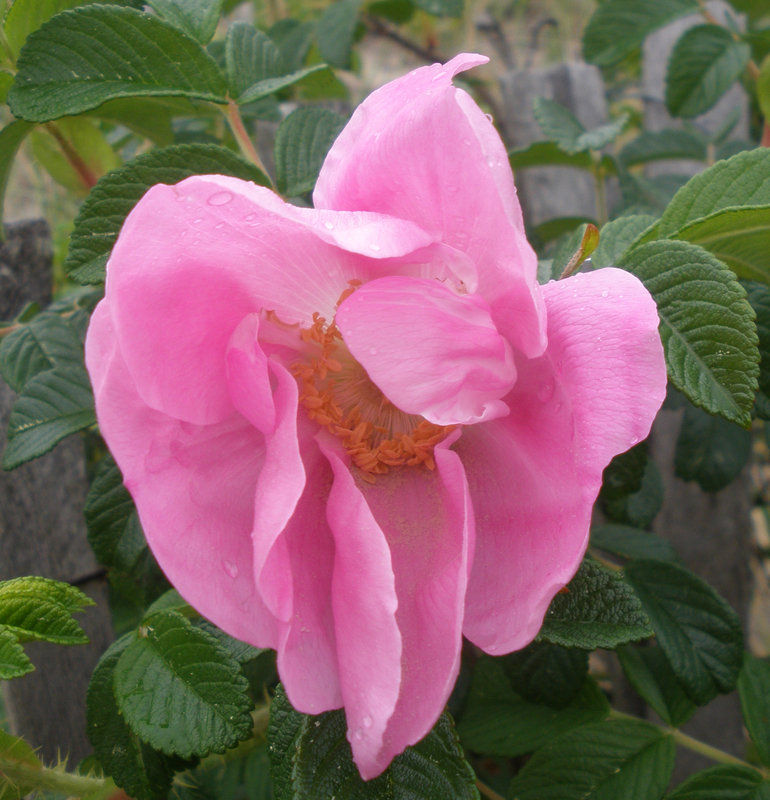 I thank them and hope they are useful elsewhere…and also for short periods of healing. One pic is here. The series is on Flickr. Bob is unquestionably better at locating and extracting glass shards from tires than I am. Let us praise the specialized abilities of others. We can also hope that we offer such small talents that can help, but first, let’s us revel in these by another when we come across them. During the Memorial-Day weekend retreat, we were off in a churchy clump cycling on the verdant and gentle Cape Cod Rail Trail. Right near the start, my rear tire went totally flat. 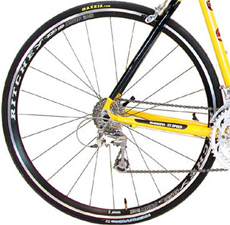 I was not overly concerned, as I always carry a spare tube and pump. After sending the horde ahead, I set to work, taking the tire off the bike and off the rim. I have done this before and knew to check the interior of the tire by eye and by running my fingers inside the tire. Over the years, I have located glass, an industrial staple and small nails in such efforts. I also checked the liner and rest of the inside of the rim. That was pretty quick as the bike used 25-mm tires with little real estate to check. I found no evil anywhere and reassembled it all with my new tube before pumping up and catching up. Another seven miles away, I had second rear flat. Double damn. I had long ago caught up and as we were just short of the destination at Coast Guard Beach, I started work again beside the road. Well, not only had I left my patch kit back at the retreat camp, I could not find anything to patch anywhere. Shortly after, I became away of kindhearted Bob’s special small talent. He came back to help…with his patch kit. We agreed that it was odd 1) to find no cause for the flats and 2) that the leak in the tubes was almost on the rim side, like it came from a spoke head, although all those were well sunk and liner covered. Bob’s talent showed that I was not as meticulous as I and others think of me. He opened the same tire I had searched several times in two locations. With great attention, he pushed from the outside as he turned what seemed a watchmaker’s eye to it. In about three minutes, he has located two minuscule glints. Each was a wee glass fragment, a tiny sharp shard. One of them surely had snuck its way into the tubes and punctured them just enough for the leaks. Bob also had a knife with which he surgically popped the shards. Then we patched a tube and I returned to the camp, where I had and installed another tube and a new tire. I do have an earned reputation personally and as a tech writer for attention to detail. Bob’s sharp eye and carefully inspection humbled me. I’m not sure that even if I had my glasses with me that I would have noticed those very small pieces of glass. He did and I was better off for it. Let us praise the special talents of others freely given. 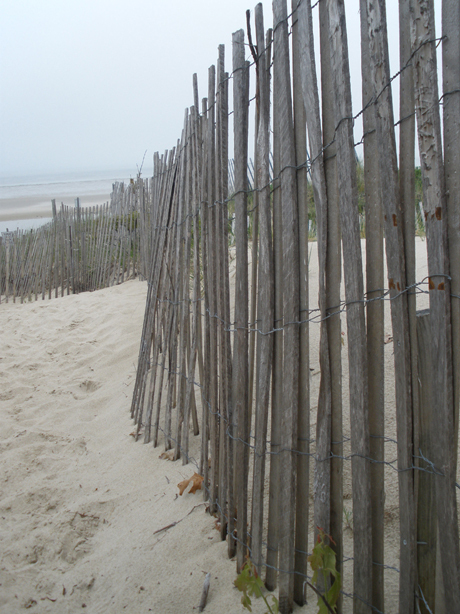 A seaside stroll grabbed me in Brewster this weekend. I found my index finger twitching at flowers and fungus and sailboat hulls and anchor floats. Digitizing occurred. To see the set, click over to the Flickr stream here. This was our church’s annual Memorial Day retreat at the Cape Cod Sea Camps. It seems we and two other church groups do this annually, although as discrete cliques. By coincidence, I met a member of the other UU church attending (Follen in Lexington, MA) two days before the weekend. At the annual meeting of the UU Urban Ministry she was one who spoke of what the UUUM meant to her. She and her family volunteer at the youth programs in Roxbury and mentor a young girl. It’s a great example of living out faith rather than just checkbook liberalism. At a session break at the meeting, I asked introduced myself to Lisa and asked whether she was headed to the retreat. She was and agreed to tell our group about her family’s involvement with the UUUM. She then did at the Sunday lay-led worship. Her husband, Hill, joined her and I hope inspired one or more of the Brookline couples to dare the inner city for some doing good. Plus, we had actually encounters beyond nodding chins among the two groups. We raised the lamb shank during the UU Seder without irony last night. However, three of us at a table of nine found a light bond around bones. During two longish periods more or less alone, we spoke of injuries to and treatments for scaphoid and tibia. A ninth grader and two middle-aged men each had tales. UUs stretch out events, perhaps because they are so lacking in the creed-based rituals and trappings of some many religions. Transmogrification of food stuffs and cough-inducing clouds of incense aren’t regular features in UU services. However, in towns such as Boston and Brookline, Massachusetts, UU churches often have Jewish members or those who identify as Jewnitarians in their dual religious beings. There the annual Passover Seders are far more elaborate and much, much longer than those I attended in homes of Jewish friends in high school and college. We also manage to create a variety show angle, with sing-along folk and gospel songs, printed and illustrated Haggadah and song books, and three hours of programming. Early on before we sat, I spoke with Scot and Joey. The former had also chaired the board at the same UU church I had many years before. They eyed my cane and Stormtrooper-style leg cast, asking for the particulars. Then I heard that Joey had broken his wrist’s big bone, the scaphoid one, requiring a graft from a hip to repair this key structural unit. My middle son had broken the same bone last year and I had learned that this bone can die and its repair is a big deal for functioning. Somewhere after some so-so Iraeli wine and cloying tzimmes, Joey and I were at one side of the table with Ed and everyone else breaking for dessert or kitchen duty. Ed wanted to know my leg details, in no small part because he had his own version. A couple of decades before, he had also broken a tibia. Unlike my twisting, splintered version, his was a pretty clean break. That inspired his doctors to say that rather than drill, cut, and rod the leg, they’d give him a long cast and a chance to knit without surgery. That meant seven months in an ankle-to-crotch cast, with all the implied discomfort and inconvenience, but with the mitigation of hope for healing without the heavy procedures. He said it didn’t work. They kept x-raying and kept seeing the two tibia pieces becoming slightly more oblique instead of healing straight. Eventually, they gave up, rebroke the bone and put the metal rod in the tibia. He actually healed after the surgery…without the uncertainty of maybe. It was not in the spirit of the evening, but I did give a thought to polling the table for other broken-bone sagas. My wife has her own from about 16 years ago. Joey was the only youth there. I wonder how many of the others, ranging from their mid-20s into their 60s could have swapped similar yarns. You are currently browsing the archives for the Brookline category.